A major pilgrimage site, venerated by the Hindus from all around, Mathura is a highly revered place for being the birthplace of the Hindu God Krishna. Once the capital of Braj in ancient period, it was at Mathura, where Lord Krishna was born to Devaki and Vasudeo in a prison from where His father took the infant to his friend at Gokul. But when He grew young, Lord Krishna came back to Mathura. This time to end His uncle Kansa's reign of terror, whom He killed and set up a new era of peace and harmony. Situated on the western bank of the river Yamuna, today Mathura is not only a home to Hindu temples, but also is a favourite destination among the Buddhists for once being a major Buddhist site. Buddhism in Mathura: The birthplace of Hindu God Krishna, Mathura is highly venerated by the people of other sects as well, the most important being the Buddhists. Although the place was visited by the Lord Gautam Buddha only once in His lifetime, but even after His mahaparinirvana, it kept on flourishing as an important Buddhist centre till about 9th century CE. The thoughts and principles of Buddhism were preached to the people of Mathura by an eminent scholar and a disciple of the Buddha, Mahakachhayana. The base of Buddhism grew stronger at the site when Upagupta, the religious teacher(guru) of the emperor Ashoka built a huge monastic complex in Mathura. It was then, the Mathura school of art also flourished to become an eminent feature of the Buddha's sculptures. The Chinese traveller, Fa-Hein, who had visited Mathura, mentioned in his account about twenty Buddhist monasteries, three stupas and five Deva temple in Mathura. However, soon due to the revival of Hinduism and subsequently the Islamic invasion of India led to the decline of Buddhism in the area by the 11th century, which has now been confined to the archaeological museum of Mathura. Significance : Birthplace of the Hindu God Lord Krishna. A Hindu and Buddhist pilgrimage. Archaeological Museum : A place worth visiting, the archaeological Museum of Mathura is an important Buddhist centre of attraction. The archaeological museum, which comprises a huge collection of Buddhist sculptures including that of the Buddha and the Bodhisattvas, throws a light on the excellent work of art belonging to the Mathura school of art, which had flourished during the Kushanas' period. Dwarkadhish Temple : Constructed in the year 1814, the Dwarkadhish temple has been dedicated to the God Krishna. 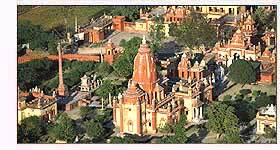 The temple, which is being managed by the followers of Vallabhacharya, is one of the most prominent temples in Mathura. An excellent work of art, the interiors of the temple include images of the Lord Krishna, His beloved Radha and other Hindu Gods and Goddesses. Ranghbhumi : "Perform your obligatory duty, because action is indeed better than inaction." - Shrimat Bhagavad Gita. Ranghbhumi is the site in Mathura, which explains why to save the purpose of human beings, Lord Krishna had to kill his maternal uncle Kansa. It was at this wrestling area, where He killed Kansa in a duel, and set His parents free from His uncle's prison. Located nearby is the Vishrama Ghat, where Lord Krishna took rest after killing His maternal uncle, Kansa. Air - The nearest airport is at Delhi, 145 kilometers away. Rail - The Mathura railway station is well connected to Delhi, Mumbai, Kolkata, Lucknow and other major cities of I9ndia by a good railway network. Road - Mathura, which lies on the National Highway number 2, is well linked with regular state bus services from Madhya Pradesh, Uttar Pradesh, Delhi, Rajasthan and Haryana. Vrindavan : A home to around 4000 temples dedicated to the Hindu deities especially Lord Krishna, Vrindavan is one of the most important pilgrimage centres for the Hindus. The history of Vrindavan dates back to around more than 5000 years ago, when Lord Krishna had chosen this place to play flute and perform 'Raasleela' with the Gopis. Located 12 kilometers away from Mathura, Vrindavan enshrines Govind Dev temple, Radha Ballabh temple, Rangaji temple, Bankey Bihari temple, Pagal Baba temple and Madan Mohan temple to name a few. Gokul : Located 10 kilometers away from Mathura, the holy land of Gokul had witnessed the childhood of Lord Krishna. It is Gokul, which saw Him stealing butter, and whenever caught making an innocent face so that nobody could punish Him. It was also at Gokul, where His mother Yashoda saw the entire universe in His mouth. Today, though a small destination, Gokul is highly venerated by the Hindus, who come here and offer prayer in Gokul Agaman, Ukhal Bandhan, Putna Moksha, Brahman Ghat, Balarama temple and the Makhan Chor Ashth Sakha Leela. Govardhan : 25 kilometers away from Mathura, Govardhan is believed to be the place where Lord Krishna had protected the entire village from the anger of God of rain, Indra by holding up the Govardhan hill on one small finger. Agra : The city of Taj Mahal- a symbol of eternal love, Agra lies just 52 kilometers southeast of Mathura. This medieval city, which is a home to several historical monuments such as Jama Masjid, Agra fort and others, is one of the favourite destinations among the tourists from all across the globe. Low and mid-bidget hotels are available in Mathura. Access : 04 Kms from railway station. 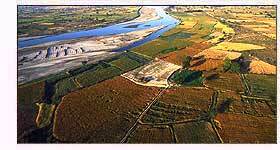 Access : 56 kms from Agra-Kharia Apt,02 kms from mathura railway station.